Most of earth’s rarest creatures are usually the first species to be in danger of extinction. They have the smallest chances to propagate or recover their diminishing number. These animals have also become rare due to the fact that their habitats that sheltered them against the peril of human exploration are all gone. 1. The Pinta Island Tortoise. One of the few species of Giant Galapagos tortoises is the rarest animal in the world because this is the only living specie of turtle left on earth. George is the only living Pinta Island land tortoise left in the island of Galapagos. George is about 100 years old, living in the island without a mate. Charles Darwin Research Station had been searching for a female mate for George and promises a $10,000 reward for those who can find a female Pinta Island Tortoise for the lonely turtle. 2. Dwarf Blue Sheep is also called the dwarf Bharal Pseudois schaeferi. It is one of the species of caprid usually found in Tibet and China and is now in danger of extinction. Since 1997, this species has been listed as endangered by the International Union for Conservation of Nature due to the decline in number from 700 to 200 left. 3. Okapi is an animal that looked something like a giraffe and a zebra. Way back the 20th century in Europe and Africa this strange, unusual animal called the African Unicorn is known today as the Okapi. The first sighting of this very rare species of giraffe was reported by Henry Morton Stanley in 1887. It is dubbed as the “living fossil” because it has no close living relatives. 4. Albino is a soft shell turtles. Shells of most turtles are hard and sturdy but not this one. These turtles have soft shells and spend most of their time waiting for small prey on the ocean floor. But their lightweight shells mean they can swiftly evade their predators as fast as 15 miles per hour. They can become vicious when threatened so you’d rather be careful when handling these curious-looking turtles. 5. The Rare White Lion: Very few people ever knew of their existence. White lions are real species of lions, not an albino version of ordinary lions. Their white color was the result of mutation of a breed of lions known as the Kruger breed. Male white lions are hefty slowpokes while females are agile and suitable for hunting. 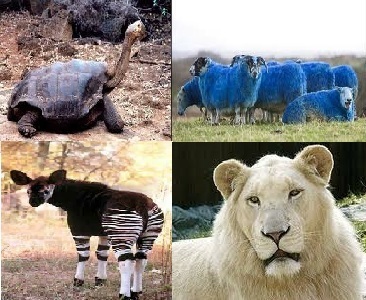 Their brightly colored coat makes it difficult to stalk for prey unlike ordinary lions in African savannahs. Only 300 of these species exist in the world today. This is so awesome!!! but i’ve seen the okapi at the oklahoma zoo before.